I've been accumulating old photos for quite some time. Many have featured on the main site already (http://www.oldclassiccar.co.uk/photograph_main.htm) over the last 17+ years, while others sit in the 'pending' file. Rather than leave these old photos sat in albums gathering dust, I thought I'd revisit a few and post them into this, the new "Photo Of The Day" thread, solely for original old photos. Most will be car-related obviously, although I'll also drop in a few that feature other modes of transport. All being well, I'll add in a new image each weekday (where possible). Hopefully the photos, and indeed the thread as it grows, will be of interest. That's really good...Rick....Shell spirit, pulled by the factory? An interesting photo, Rick. I am puzzled by the rustic style secondary shafts on the vehicle and the fact that they have props on the leading ends. Is the liquid contained actually petrol, or is it something less volatile? the lid is open and unattended. Rick, in your opening remarks, did you mean "start the bull rolling"? The motive power here is a steer. Great idea for the photos, Rick, I'll be looking forward to more appearing. POTD for today is this head-on view of Jaguar Mk7, registration LWK 343. This was first added to the main site in 2008. Research confirmed that the car had circuit, rally, and speed record (!) history, in the hands of luminaries such as Mike Hawthorn and Stirling Moss. JWK 343 was driven by Gordon Wilkins and Raymond Baxter in the '52 Monte. Gordon Wilkins ditched his Mark VII Jaguar and another car carried away his de-ditching gear as he and Baxter were trying to retrieve it. 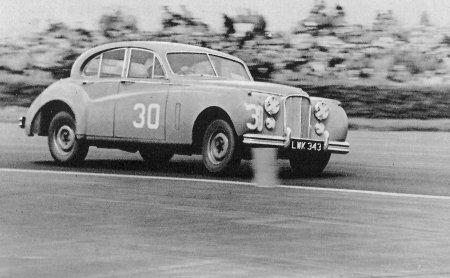 The "works" .Jaguar Mark VIIs, in one of which Gordon Wilkins and Raymond Baxter were coping with both the rally and BBC broadcasts, were seen to be minus their rear-wheel "spats," to have had their knave-plates removed from the hubs and to possess louvres in the bonnet top panels for screen de-icing. Silverstone 1952 win. Also competed in 1954 Monte (8th) and 1956 Monte, Vard & Jolley. POTD #3 is this appealing (to me anyway) Tempo Matador dropside pickup, in service with the RAF/TAF. The photo was added to the main site in August of 2006. POTD #4, originally posted on OCC in July 2009, is a snapshot of a young chap with dreams of the open road, behind the wheel of a "tired" Vauxhall 10. Oh yes..been there, done that......it is amazing how the dreams of youngsters are so very different these days? I would spend hours with my late uncle's old Standard eight droophead...once it was out of use, so to speak. I believe it ended up in a field.....I wasn't around to do much about it at the time. POTD #5 is a snap from 1927 of a Model T Coupe, sporting a Minnesota licence plate. Originally published on OCC in August 2009. Today's POTD offering is this snapshot from 1954 taken at the Pontins Brean Sands holiday camp. The car is a Morris 8 Series 1 tourer, being pursued by a Ford Model CX. First published on OCC in October 2012. Apparently, sidecars are becoming more and more popular. The following photo - today's POTD - of a James sidecar & motorcycle combo, was first featured on OCC in April 2015. Very good! !...Question...How did those flat caps stay on at speed? Today's POTD is one of a set of unique photos featuring a time-worn, rear-engined, Crossley Streamline from 1935. The seven photos of this car first found their way onto OCC in February 2011. Your original page refers to the Crossley being registered in late 1935 or early 1936; it actually dates from quite late in 1936. My father's Rapier was registered in the Spring of 1936 as CLB 203, and the following DLB sequence started in November 1936, so I would guess CLB 844 dates from late September, early October.